We meticulously calibrate and maintain our equipment to the highest industry standards in order to achieve optimum results. Our professional sanding typically involves using several types of sanding machines, each performing a specific task. 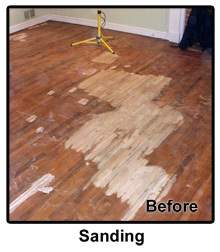 Depending on the extent of wear and tear on your floor, we may need to sand the floors three or more times. The first cut is done with a course grit of sandpaper which removes the old finish, the second cut removes what's left of the old finish, and the third cut removes the marks left by the first two cuts which helps smooth out the surface. 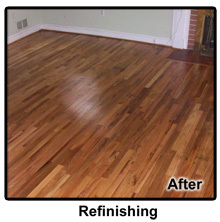 The goal of sanding is to remove as much finish as possible, while removing as little wood as possible. In some cases the floors may be too damaged to refinish, and may need to be repaired. Repairing a floor is necessary if a floor becomes saturated with water, or pet stains. Water causes the wood to cup or crown, and when dry causes significant wood shrinkage. Pet stains cause the wood to turn black and shrink, these types of damages generally cannot be corrected by sanding, and should be repaired. Repairing a floor requires a good bit of knowledge, the wood type and grade must be determined, the tongue and groove direction must also be determined. Each piece of damaged wood must be removed by hand, not machine. The goal of any repair is to not be able to tell it was done at all.